Meanwhile, RSS sources in Nagpur said Pranab Mukherjee had met RSS chief Mohan Bhagwat at least four times after leaving Rashtrapati Bhavan. 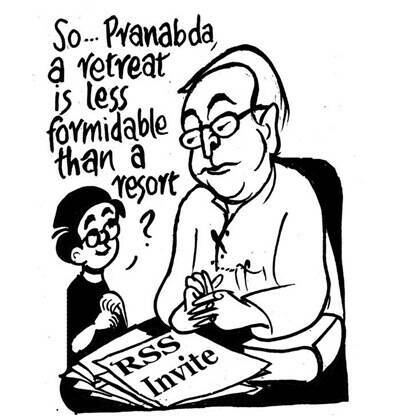 Former President Pranab Mukherjee’s reported decision to be the chief guest at an annual RSS event at its headquarters in Nagpur has surprised many in the Congress. But with Sonia Gandhi and Rahul Gandhi out of the country, and their view on the matter not known immediately, many party leaders refrained from airing their views publicly. According to the RSS, Mukherjee will be the chief guest at its valedictory session of the ‘Tritiya Varsh Varg’ or the Third Year Course on June 7. Mukherjee is learnt to have given his consent to participate in the programme. “We have invited the former President of India and he has given his consent for participating in the programme,” a top RSS functionary said. A Congress leader said it was Mukherjee who had moved the political resolution at the AICC’s Burari plenary session in 2010, asking the then UPA government to “investigate links between terrorists and the RSS and its sister organisations that have been uncovered in some recent cases”. Several top party leaders, including A K Antony, declined to comment, saying that they were unaware of Mukherjee’s programme. “He is an intelligent person. He has been the President of India. He is secular minded. So there will be no change in his behaviour by going there. He will remain the same,” former Union Minister Sushil Kumar Shinde told The Indian Express. “I think the best person to answer that question is the former President himself. The invitation was extended to him. He has accepted the invitation. Ostensibly he is going. So therefore, if there are any queries with regard to that, he is the best person to answer that,” said Congress spokesperson Manish Tewari when asked how the party viewed Mukherjee’s decision. “Why are you asking me? Ask other senior leaders,” was the reaction of another senior leader. Meanwhile, RSS sources in Nagpur said Mukherjee had met RSS chief Mohan Bhagwat at least four times after leaving Rashtrapati Bhavan. “The first meeting between the two happened when Mukherjee was President. Subsequently, the two met at least four times. Frequent exchanges do blunt the sharp edges of difference of opinion. This paved the way for Mukherjee to accept the invitation,” said a senior functionary. Sources added that Union Minister Nitin Gadkari may have facilitated the meetings between Mukherjee and Bhagwat. “Also, the RSS has a tradition of inviting people not belonging to its ideological line of thinking to two of its most important programmes in Nagpur — the annual camp and foundation day. In 2007, former Air Chief Marshal A Y Tipnis was invited,” said the functionary.